In preparation for today’s pride parade, Calgary, Alberta, has been using the “pride bus”; a rainbow-painted bus declaring “Happy Pride” on its destination screen. But one bus driver is worried over losing his job, saying his Christian beliefs keep him from taking the wheel. Jesus, noted driving enthusiast, does not agree. 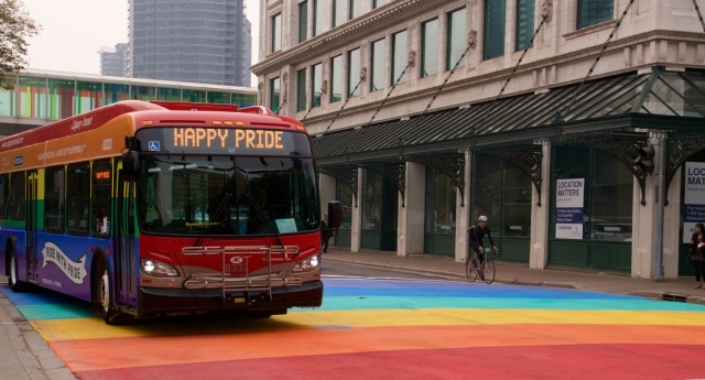 Calgary Transit confirmed that a bus driver cannot opt out of driving the pride bus. But what Rau doesn’t understand is that people don’t expect bus drivers to necessarily agree with everything the bus says. We don’t hold bus drivers responsible for the advertising that adorns the bus, so why would this be any different? We wouldn’t assume a bus driver isn’t homophobic just because he drives the pride bus, we’d assume he’s isn’t homophobic because not being a homophobe is just common sense. As of press time, Rau still has his job.